AirPrint is Apple's technology that allows you to print from your iPad, iPhone or iPod touch. 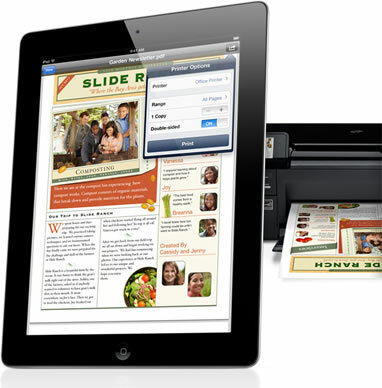 AirPrint on iPad makes it simple to print your email, photos, web pages, and documents. There’s no software to download, no drivers to install, and no cables to connect. With just a few taps on your iPad, you can go from viewing something on the screen to holding a printed copy. "No cables" means exactly that. AirPrint printing is 100 percent wireless. iPad automatically locates and connects to AirPrint-enabled printers on your Wi-Fi network. This is an unofficial list of wireless printers which are are compatible with the AirPrint technology. These are printers that Apple have recommended on their site. These are printers that I have personally tested. As with any list new printers will be released that are not on this list, and updates to the printers and/or the iPad may result in a compatible printer to stop working. These apps from the App Store, usually through a third party app on your Mac (or PC) allow you to print from your iPad to a non-AirPrint printer. Samsung Mobile Print - Samsung Electronics CO.LTD. Canon Easy-PhotoPrint - Canon Inc.